427 pages, 12 x 10.5 x 17"
I went to China for the first time to celebrate the entry to the new millennium in December/January 1999/2000. This passage was well known as Y2K. While riding in a taxi from the airport to the hotel in downtown Beijing, I was shocked at the sight of my first Chinese tricycle. It was being driven, or should I say ridden, by a little old lady. On the back of it were all these Napa cabbages piled so high it looked enormous; it had to be at least 7 feet high. So, how much cabbage could that be? It had to be 500 pounds or more. Since then, I have been to China fifteen times and have traveled to many of its provinces. Each time I go, I remember that I am totally enamored of these vehicles – these tricycles. They come in many different forms and sizes. Some are totally or partially motorized while others are operated by human power alone. Some appear to be handmade and feature many personalized components. Others seem to be morphs of motorized – “tricycle-ized,” “motorcycle-ized”—vehicles. The Chinese use tricycles to deliver many different things from the mail to fruits and vegetables and even people. Others serve as garbage trucks. Some appear to be made by companies that specialize in their manufacture only insofar as they are consistent in their colors and forms. Some travel at quite fast speeds while others, like the one driven by little lady delivering cabbage, travel at a very slow yet methodical pace. In this book, I tried to capture the great variety of tricycles that I have encountered in China. From the very old and rickety ones to the sleek modern ones, from ones obviously much loved by their owners to those abandoned. Most of the images come from various neighborhoods in Beijing, while others come from areas around Xi’an and Shenyang. The best images always seem to invade me. These are the ones of tricycles with things piled very high and usually seen while driving down the highway very fast. I can’t grab my camera fast enough or I simply can’t take the picture and I only see them for an instant. 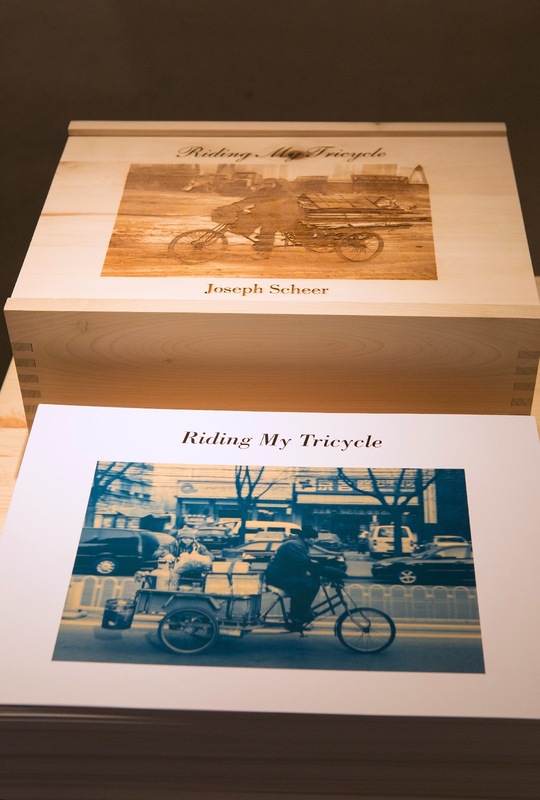 Many of the images in this book are from local neighborhoods where tricycles are easier to photograph either by walking around areas where they are parked or capturing them as they slowly pass by. Many of the pictures reveal that the people riding the tricycles are just as curious about me as I them about them. They’re probably wondering, “What is this big American guy with his big camera doing photographing us as we zoom by?” Their expressions are wonderful. I feel as if I catch a bit of their culture and celebrate their lives. I hope to continue capturing images of tricycles and expand this collection with each future trip to China. I especially want to capture more images of tricycles with huge piles of stuff on their backs. Like the image collection of moths, it will be a project that I could never complete for the diversity of the species and what they carry. Perhaps this project is a bit self-indulgent in the way that many collections and collecting processes are. I am not sure what people will think when they see these. Of all the things that I collect for book projects I hope to continue this one to celebrate the sight of these wonderful vehicles.